The Pheromone Information Library is a site which aims to provide the most up to date and accurate information on the use and science of human pheromones. For those who are new to pheromones, a good place to start would be the Introduction to pheromones page. Here some basic topics will be discussed and further reading is suggested. 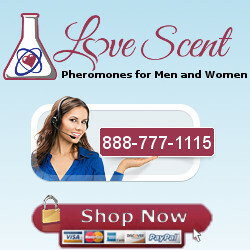 In the confusing world of pheromone retailers telling their customers whatever they want to hear to get them to buy their products, the Pheromone Information Library provides unbiased and accurate information written by existing users of pheromones. If you have any questions or comments, be sure to visit the forum and post there. The Pheromone Information Library also has a large collection of links to pheromone research articles. If you are new to pheromones or are a first time user, please take a look at the Newbie FAQ and Product Guide first as these should answer most of your questions. If anything isn’t answered properly here, or you want more information, visit Love Scent and browse the forum.